Today's Fact: Flamingos rest by standing on one leg. The “knee” of the flamingo is actually an ankle joint and the lower leg bends forward. Don't you just love them?? Each towel is hand-painted and can be washed in the machine, laid flat to dry. 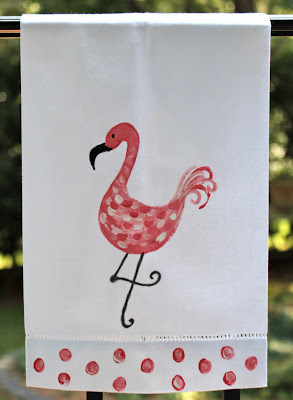 What a cute hostess gift for only $15 per towel or $25 for a set of two. Adorable and the polka dots send it over the top! Super cute and great price point!! Have a great weekend! Thats an awesome DIY project as well! you can buy fabric paint (very inexpensive) at any art store, its fun for a summer day! :) they look so cute!